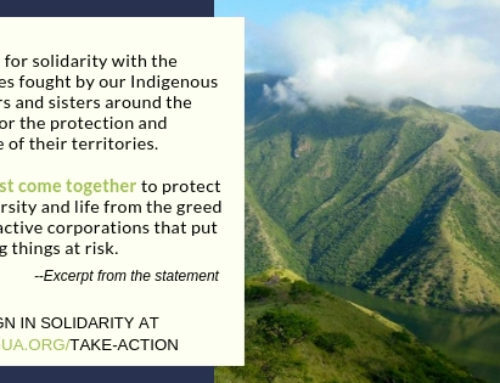 The following was written by Josh McLeod, an international accompanier with NISGUA who accompanied the plaintiffs in El Jute. This article originally appeared on UpsideDown World. Original article can be found here. As the evening sun disappeared below the horizon I could just make out Don Virgilio’s profile against the fading but brilliant orange, blue and purple light of dusk behind him. Don Virgilio, like all the campesinos I have met in Guatemala is extraordinarily hospitable, humble and kind. He was dressed in impeccably clean jeans and a long-sleeve dress shirt—despite the oppressive heat—recently polished boots, the ever present cowboy hat and a machete: always with the machete, even when there is not the slightest chance that one might need a large knife men here always carry around their machetes. Don Virgilio is pushing 40 and shows the wear and tear of struggling to make a living in rural Guatemala. Grasping his hand for a shake you feel the calluses of a thousand hours spent turning the earth with a wide-bladed hoe and chopping fire wood. My partner Annie and I had spent most of the day traveling east from Guatemala City to sweltering Chiquimula where we baked sitting inside a mini-bus waiting to go up into the mountains to Virgilio’s village. We arrived hot, dusty and tired, though quickly forgot about our weariness when we met Doña Teresa, Virgilio’s wife. Limeade made from the limes growing in their yard quenched our thirst while Teresa stood by the concrete sink plucking feathers from a hen that ultimately found its way into a delicious caldo de gallina,a hearty soup of vegetables and chicken in a rich broth with the obligatory stack of steaming tortillas—but those thick hand patted crispy-on-the-outside-warm-and-soft-on-the-inside tortillas made from corn grown right there in the village; the kind of delicious tortillas hard to find in Guatemala City. We had just finished dinner as night fell and were chatting under the palm thatches of Don Virgilio’s roof. After a brief lull in conversation he began talking about what happened in El Jute in the 1980s. Virgilio told us that in the late 1970s a group of men in El Jute, family members and friends of Virgilio (of the names Chegüen and Gallardo) got into a disagreement with what turned out to be the wrong people: military commissioners from El Jute and surrounding villages, namely a man named Salomo Maldonado. In the next couple of years the tension between the families increased until finally in mid-1981 Maldonado denounced a number of men as guerrillas to Colonel Marco Antonio Sánchez at the military base in nearby Zacapa. Not long thereafter, early in the morning of October 19, 1981 Colonel Sánchez along with several commissioners and a group of soldiers from the Zacapa base arrived in El Jute and took 7 members of the Chegüen and Gallardo families from their homes. Not one of them was ever seen again. Their names are: Jacobo Crisóstomo Chegüen, Miguel Ángel Chegüen Crisóstomo, Raúl Chegüen, Inocente Gallardo, Antolín Gallardo Rivera, Valentín Gallardo Rivera and Santiago Gallardo Rivera. During La Violencia—the term many Guatemalans use to refer to the harshest years of the war here—the Guatemalan military recruited and organized local civilians as what they called military commissioners. These commissioners acted as civilian agents of the army, local strongmen who frequently organized the ubiquitous Civilian Auto-Defense Patrols (PACs—Patrullas de Autodefensa Civil). At the height of the war the PACs incorporated more than 1.5 million civilian men into paramilitary groups, many of whom committed atrocities, sometimes under military obligation sometimes independently. Together the commissioners and PACs militarized virtually the entire country. The commissioners also served in an intelligence capacity as the local level eyes and ears of the army, responsible for reporting potential “subversives” in the community. Thousands upon thousands of people were reported as subversives and were taken into custody by the army and police during the war, most never to be seen again. To this day there are more than 45,000 unresolved cases of people who were disappeared during these years. Perhaps it is a banal truth that power corrupts; this is certainly true of many military commissioners. They frequently took personal advantage of the power over life and death they exercised. For example, turning in a neighbor with whom they had a dispute over property boundaries, thus “eliminating” the problem and taking over the neighbors’ land. It was easy and frighteningly tempting to inform on someone because of petty reasons that had everything to do with personal politics and nothing to do with the counter-insurgency politics of the state. You were insulted in the cantina? Report the person to the army. You want that man’s wife? Report him to the army. “Problem” “solved”. The army could be easily manipulated into doing the bloody bidding between feuding neighbors. Such was the case in El Jute: there was a personal disagreement that resulted in seven men being extra-judicially kidnapped from their homes, under the guise of being collaborators with the “subversion”, presumably tortured and murdered, their bodies being hidden in unmarked graves. While it is assumed that those disappeared were tortured and murdered, the relatives of the disappeared do not concretely know where they are or what happened to them. Don Virgilio said that the men from El Jute were presumably taken to the military base in Zacapa where they were tortured and killed before their bodies were incinerated and buried somewhere within the base. Expressing his pain and outrage, even after 27 years, Virgilio affirmed that only God has the right to remove people from the earth, if anyone else commits such an act against human life they must face justice. Like so many people in Guatemala, too many, Don Virgilio has a painful personal history of loss during the years of La Violencia. And like so many others this painful history is without closure, in this country rife with impunity justice has never been served for thousands of victims. 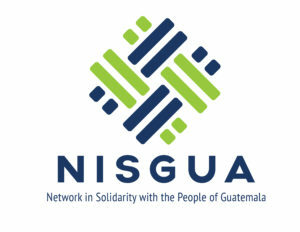 A number of years ago in order to bring closure to the disappearance of their loved ones and to fight so that one day justice arrives in Guatemala, don Virgilio along with a number of other family members and friends of the men disappeared in El Jute organized themselves into what they call El Grupo. This is, well, a group of survivors and witnesses to the forced kidnapping and disappearance in 1981. 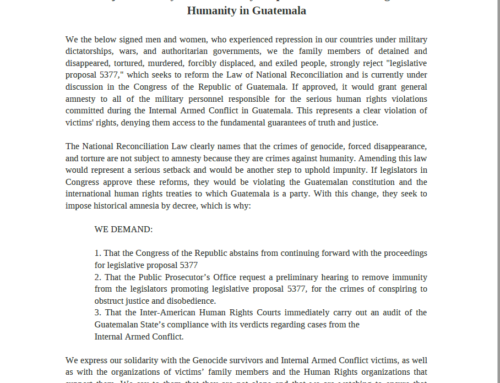 In 2005 they gained the support of the independent, though state funded, Guatemalan Human Rights Ombudsman’s office (PDH—Procuraduria de Derechos Humanos) and in 2005 filled suit against the now ex-colonel and three ex-military commissioner alleging the forced disappearance and assassination of the seven men from El Jute in 1981. This same year the ex-colonel and three ex-commissioners were jailed pending the resolution of the case. After this exciting initial success bureaucracy set in and not much happened until early April when it was announced that the case is finally going to trial. In the mean time the members of El Grupo have faced constant threats and intimidations from the family members of those who killed and disappeared their loved ones. These family members live in El Jute and other nearby villages; the witnesses of El Grupo encounter these people on a daily basis. The commissioners have family members working in the States who are rumored to be saving up the substantial money one can earn there to “take care of the problem” in El Jute. There are rumors that the witnesses are actually communist guerrillas who want to restart the war. They even say that the gringos who come to visit (us) are military advisors to the incipient insurgent group. Our friends in El Grupo also interpreted the attempted bribe as a sign that the guilty are shaking in their cells, scared that they might actually be held responsible. They assume this desperate measure has to do with the recent announcement that all the many legal procedures leading up to a trial have been completed and that a judge is finally sending the case to trial. 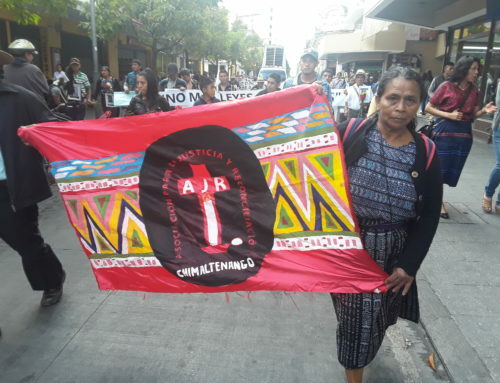 This case is hugely important in Guatemala; it is precedent setting as it is the first time in Guatemalan history that a military officer will face trial for the crime of forced disappearance. This could open the flood gates for some of the thousands of other cases of disappeared persons. Guatemalan President Alvaro Colom recently ordered the declassification of police archives from the war, which could greatly help this process. 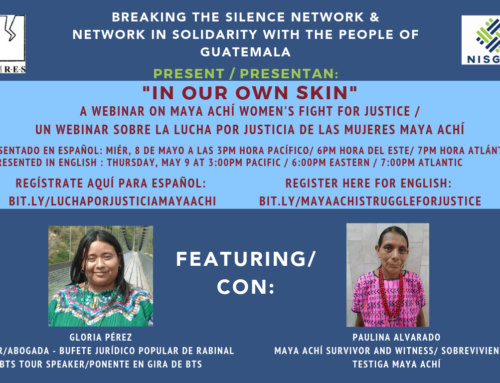 These are potentially huge steps for justice and against the endemic impunity and silence in Guatemala. These are signs for hope that things actually are changing here. Despite the painful past the members of El Grupo speak strongly of their struggle and are very clear about their goals. 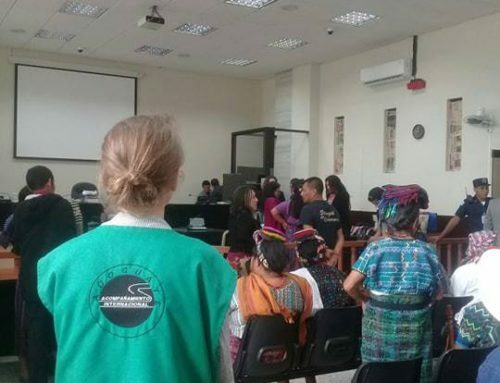 Their struggle is not just to hold the accused accountable in their particular case but to help build a different Guatemala, one where the past is acknowledged and where the justice system functions holding the guilty responsible for their crimes. A Guatemala they can be proud to hand down to their children.